Thoughtful gifts make life beautiful! Lampe Berger comes in many shapes, sizes, colors and styles. Choose one that fits your decor. Add fragrance to your home with Lampe Berger. Lampe Berger is a patented, unique device that removes odors and adds fragrance in your home, office, lakehouse, boat, RV, or any enclosed space. It's a decorative accessory that is attractive and functional, making it one of Ann's all-time best gifts. Ann's is a large independent retailer of Lampe Berger in the US and we use at home, too. How does it work? 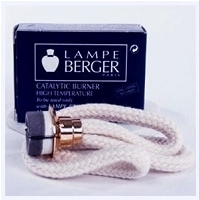 Lampe Berger's patented burner removes household odors while putting the fragrance of your choice into the air. Cooking smells, mustiness, odors from dog and kid's shoes, you name the smell...Lampe Berger gets rid of it. We have over 70 Lampe Berger Home Fragrances, including retired fragrances no longer produced by Lampe Berger Paris. When you buy Lampe Berger products at Ann's Houston store, you can sample our testers to see what they smell like before you purchase the fragrance. Once you use Lampe Berger, you'll wonder how you lived without it! Come to Ann's and let us demonstrate Lampe Berger for you. We know you'll love it as much as we do. 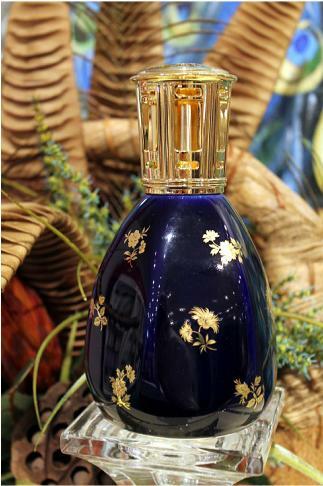 Lampe Berger lamps are priced from $29.50; Lampe Berger home fragrances, from $21.95. sizes, colors and styles. Choose one that fits your decor! Lampe Berger fragrances are alcohol based. Fragrances come in half-liter size bottles; some fragrances are available in liter size. 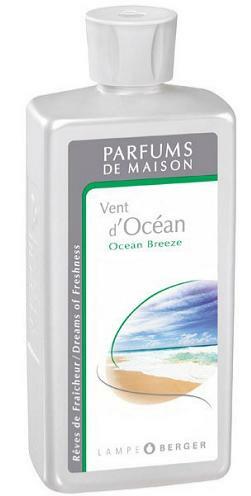 Ann's has over 70 fragrances, including many retired fragrances still in stock. Click here to see fragrance list. Lampe Berger at Ann's online! Your Lampe Berger purchase includes a wick/burner. Wicks have a normal burn life of 200 hours or more. Additional wicks can also be purchased separately. Order Lampe Berger Home Fragrances from Ann's Online! 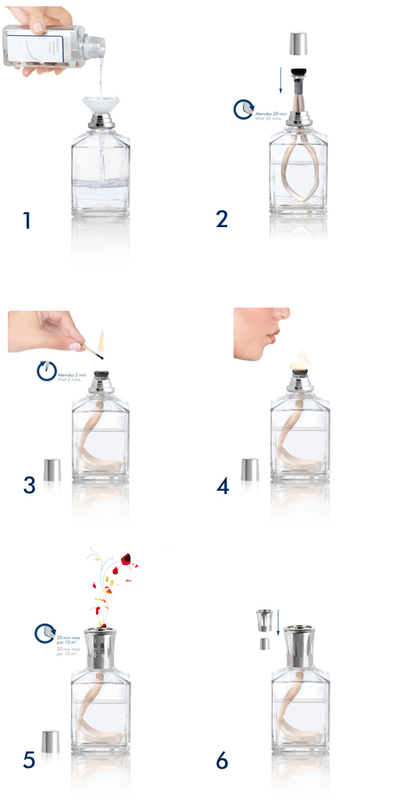 Pour Lampe Berger fragrance into your lampe no more than 1/2 way. Insert the wick into the lamp, put the little cap on it and leave it to soak for 20 minutes. After 20 minutes, remove the cap, light the burner and let it flame for two minutes, then blow out the flame. Now the lamp is working to remove household odors and put fragrance into the air. Place the grill (large top with slits in it) over the burner. Simply replace the little cap over the hot burner when you are ready to "turn it off." This will snuff out the burner safely. See the pictures, right, for a visual guide to these instructions. You can let Lampe Berger burn until all the fragrance is gone. It will "stop" when it runs out of fragrance. To start it again, repeat the steps above (refill with fragrance and make sure wick is soaked before lighting.) A dry wick will not light, and a hot burner will scorch your fingers, so let it cool before you handle it. To switch from one fragrance to another, make sure burner is cool enough to touch. Remove burner/wick. Use your funnel to pour remaining fragrance from the lamp back into its bottle. Pour desired new fragrance into lamp. Insert wick. (If wick is dry, repeat steps at the beginning of these instructions.) Light, let flame, then blow out flame. At first, you'll smell the first fragrance as it burns through, then the second fragrance will appear. Don't fill your lampe over your great-grandmother's colonial heritage antique table. 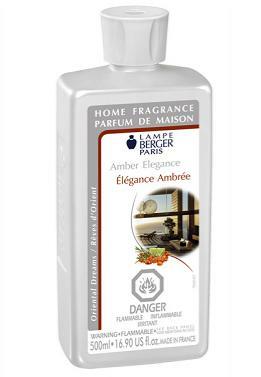 Lampe Berger fragrance is alcohol based and will ruin the finish of varnished or painted surfaces if it spills on them. A ceramic or glass dish under your lampe will catch and drips that happen when you pour in the fragrance. For more information, please refer to the instruction booklet that comes with every Lampe Berger Home Fragrance kit. Never leave your burning Lampe Berger unattended!